Rolando fracture - There is intra-articular comminution. For patient education resources, see the Breaks, Fractures, and Dislocations Center, as well as Broken Finger, Finger Dislocation, and Broken Hand. The thumb has only 2 phalanges: the distal and proximal phalanx. Fractures of these phalanges are generally diagnosed and treated identically to phalangeal fractures of the other digits. Distal phalanx fractures can be separated into extra-articular tuft fractures and intra-articular tendon avulsion injuries. Tuft fractures generally are caused by a crush injury to the distal thumb. Tuft fractures frequently are associated with nail bed injuries and are technically open fractures when a nail bed injury is present. Tendon avulsion injuries are often secondary to avulsion of the extensor tendon at its terminal insertion into the distal phalanx. The tendon may pull off a fragment of bone resulting in a "bony" mallet thumb deformity. The flexor pollicis longus, in contrast to the finger flexors, also can be avulsed at the musculotendinous junction. Closed mallet thumb injuries are uncommon. The mechanism of closed injury is usually secondary to an acute forceful flexion of the thumb IP joint, leading to an avulsion of the extensor tendon with or without a bony fragment at its distal phalangeal insertion. 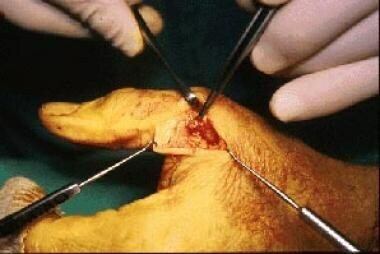 The open injury secondary to laceration of the distal portion of the extensor tendon is more frequent. The IP joint of the thumb functions as a hinge (trochlear) joint with motion primarily in the plane of flexion and extension. Collateral and accessory collateral ligaments as well as the trochlear shape of the joint provide IP joint stability to radial and ulnar forces. The palmar plate, a thick fibrocartilaginous structure, provides support to the volar aspect of the joint. A flexible capsule is present dorsally and volarly providing freedom in flexion and extension. In approximately 70% of individuals, a single sesamoid is present within the palmar plate at the IP joint; this functions to increase mechanical advantage of the flexor pollicis longus (FPL) tendon. IP joint dislocations, usually dorsal, occur infrequently. The mechanism of injury usually consists of hyperextension with a variable amount of rotation. 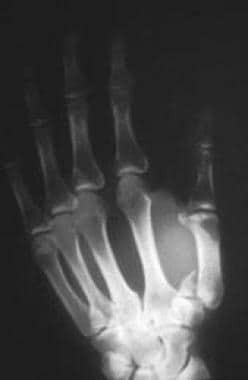 An inability to reduce the dislocation may be secondary to interposition of the palmar plate, secondary to rupture of this structure. The ruptured palmar plate is subsequently trapped in the joint with the attempted reduction maneuver. Most reported irreducible dislocations are open with the base of the proximal phalanx exposed in the wound. Dorsal dislocations are much more common than volar dislocations. Volar dislocations are rare and usually are associated with collateral ligament ruptures. Volar dislocations are more commonly irreducible than dorsal dislocations, secondary to interposition of the dorsal capsule and either the extensor pollicis longus (EPL) or the extensor pollicis brevis (EPB). The mechanism of injury for dorsal dislocations consists of MCP joint hyperextension secondary to falling on an outstretched hand or axial loading to the tip of the thumb. Dorsal dislocation frequently leads to the palmar plate tearing proximally and moving distally. The palmar plate may become interposed within the joint, leading to an irreducible dislocation. Thumb metacarpal head fractures are rare secondary to mobility of the thumb CMC joint. Direct trauma to the joint is the usual mechanism of injury. Open reduction and internal fixation (ORIF) is indicated for displaced intra-articular injuries. Thumb metacarpal shaft fractures also are rare secondary to mobility of the thumb CMC joint. Because of stronger cortical bone of the thumb metacarpal, much higher energy is needed to fracture the thumb metacarpal shaft versus the metacarpal shafts of other digits. These fractures frequently result in shortening and malrotation. Shortening and collapse occur secondary to the lack of intermetacarpal ligaments and deforming forces of intrinsic musculature. Thumb metacarpal base fractures are common. The mechanism of injury is usually an axial load applied to a slightly flexed metacarpal shaft. The thumb CMC joint has considerable mobility secondary to the bony anatomy of the trapezium and metacarpal base, two apposed saddles whose longitudinal axes are perpendicular to one another. Ligamentous stability at the trapeziometacarpal joint is maintained by the anterior (volar) and posterior oblique ligaments, anterior and posterior intermetacarpal ligaments, and the dorsal radial ligament. Thumb metacarpal base fractures are classified into extra-articular and intra-articular. Intra-articular fractures are more common and are subdivided into Bennett fractures, Rolando fractures, and comminuted fractures. Extra-articular fractures at the base of the thumb metacarpal are common, are usually transverse or oblique, and occur at the proximal metaphyseal-diaphyseal junction. The distal fragment usually is adducted and flexed secondary to the pull of the adductor pollicis (AP), abductor pollicis brevis, and flexor pollicis brevis. Bennett fracture (see first image below) is an intra-articular basilar fracture of the thumb metacarpal in which a single volar ulnar base portion remains intact. The anterior (volar) oblique ligament holds the volar ulnar fragment in place by its attachment to the trapezium. The remainder of the metacarpal shaft is displaced dorsally and radially secondary to the pull of the abductor pollicis longus (APL), AP, and thumb extensors (see second image below). The strong pull of the abductor pollicis longus frequently leads to displacement of the metacarpal shaft in a radial direction and may require operative intervention. 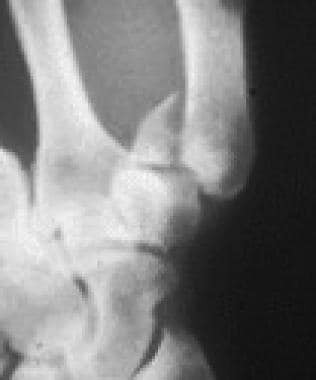 A Rolando fracture (see image below) is a 3-part intra-articular basilar fracture of the trapeziometacarpal joint. In addition to the metacarpal shaft, a fracture configuration of a T or Y pattern with both volar and dorsal fragments is present. It is the least common of the metacarpal base fractures. The volar carpal ligament remains attached to the volar fragment, and the APL remains attached to the dorsal fragment. An intraoperative photograph of a Stener lesion. Clinical presentation varies by location. Pain, swelling, decreased range of motion, and, occasionally, deformity are present in the fracture area. Distal phalangeal fractures may involve the nail bed. Carefully evaluate the sterile and germinal matrices if the nail bed is involved. Mallet thumb presents with the thumb in a slightly flexed posture and an inability to extend the thumb at the IP joint. These may be due to closed injury or an open laceration. Thumb IP dislocations usually are dorsal and are easily recognized by the deformity created by the distal phalanx riding dorsal to the distal end of the proximal phalanx. Thumb MCP dislocations present with the usual findings of pain, swelling, and decreased motion in the area of the thumb MCP joint. The proximal phalanx may be hyperextended or parallel to the metacarpal in bayonet fashion. If a palmar dimpling, puckering, or abnormal skin crease is present, suspect an irreducible dislocation. The proximal phalanx may be hyperextended and dorsal as well as parallel to the metacarpal. Radiographs show obvious dorsal dislocation of the proximal phalanx on the metacarpal. A widened joint space may indicate interposed soft tissues. Radiographic finding of the sesamoids interposed between the proximal phalanx and the metacarpal head indicates an irreducible dislocation by closed manipulation secondary to volar plate rupture and require surgical intervention. Fractures of the metacarpal head present with pain, swelling, decreased range of motion, and often are associated with soft tissue injury. Crepitus may be present with displaced intra-articular fractures. Fractures of the metacarpal shaft present with pain, swelling, and often, angular deformity, typically apex dorsal or apex radial. Patients with thumb metacarpal base fracture generally present with swelling, tenderness, limited range of motion, and occasionally an obvious deformity at the base of the thumb. Crepitus may be present with intra-articular fractures. The dorsally and radially displaced metacarpal shaft may be obvious on visual or manual inspection. Because these rare injuries frequently reduce spontaneously, the only acute findings may be pain, swelling, and decreased range of motion. History of a valgus injury to the thumb is often present. This is a common injury in skiers who fall while continuing to hold onto their ski poles, producing an acute, forced radial deviation of the thumb. Pain, swelling, and ecchymosis over the ulnar aspect of the MCP joint are present. A mass or lump may present in the area of injury, representing the distal end of the torn ligament lying superficial to the adductor aponeurosis; this is referred to as a Stener lesion. Lack of a palpable mass does not exclude a Stener lesion. Obtain radiographs prior to valgus stress testing to exclude the presence of a thumb proximal phalanx or metacarpal fracture. Tuft fractures rarely require reduction or fixation. Transverse fractures of the distal phalanx may be unstable secondary to pull of the FPL on the proximal fragment. Unstable fractures may require percutaneous pinning. Incongruous intra-articular fractures require reduction and fixation. If there is more than 20-30° of angulation in the lateral plane, an IP joint extensor lag is produced and reduction is indicated. Less than 20° of angulation in the lateral plane may be acceptable. Displaced spiral or oblique fractures require accurate reduction and may be stabilized by percutaneous pinning or open reduction. Transverse fractures usually are stable after closed reduction. Treatment for mallet thumb is usually nonoperative. Continuous undisturbed splinting in extension for 6 weeks should be followed by night splinting in extension for an additional 6-8 weeks. Operative indications include open injury, failed closed treatment, chronic injury and/or mal-union, or a mallet thumb with bony avulsion. Thumb IP dislocations generally are easily reduced in a closed manner. Operative indications include an irreducible dislocation or unstable IP joint after relocation, open injury, and chronic dislocations. Attempt closed reduction in all patients with thumb MCP dislocations, regardless of the presence of radiographic or clinical signs of irreducible dislocation. Operative indications are similar to those for thumb IP dislocations and include irreducible dislocation, unstable MCP joint after relocation, open injury, and chronic dislocations. Treat metacarpal head fractures, intra-articular by definition, with ORIF if evidence of joint incongruity or displacement exists. Stable anatomic reduction allows for early motion and a reduced risk of post-traumatic stiffness and/or osteoarthritis. Shortening and collapse frequently occur secondary to the lack of intermetacarpal ligaments and the deforming forces of intrinsic muscles. Attempt closed reduction of displaced fractures. Malrotation is usually not a problem. Treatment goals are to restore length and preserve the web space. Indications for open reduction include shortening of more than 2 mm, angulation of greater than 20°, significant rotation, and open fractures. Extra-articular fractures: Closed reduction of extra-articular metacarpal base fractures usually are successful and can be maintained in a carefully applied thumb spica cast that excludes the distal phalanx. Transverse fractures generally are stable, while oblique fractures may displace after reduction with the metacarpal shaft going into adduction and flexion. Operative indications include angulation greater than 30°, comminuted fractures with shortening, and open fractures. Bennett fracture: Closed reduction and thumb spica cast immobilization is effective in the treatment of Bennett fractures if reduction can be maintained. The strong pull of the APL frequently leads to displacement; thus, open or closed reduction with percutaneous pinning is frequently required (see image below). More than 1 mm of articular incongruity after closed reduction indicates operative intervention. This degree of articular incongruity is associated with an increased rate of articular degeneration in the thumb CMC joint. Attempt closed reduction if necessary although these dislocations frequently reduce spontaneously. If the reduction is stable, then a thumb spica cast is the preferred treatment. Assess stability prior to thumb spica application. If the reduction is unstable, then percutaneous pinning or flexor carpi radialis (FCR) reconstruction is necessary. Open irreducible dislocations and treat with either pinning or FCR reconstruction. Treat acute incomplete ruptures (in which the accessory collateral ligament remains intact) in a short arm thumb spica cast for 4 weeks. Surgical repair is recommended for acute complete ruptures or symptomatic chronic ruptures. The thumb affords prehensile abilities that were essential in our evolution. The bony anatomy of the thumb consists of two phalanges and a metacarpal, which articulates with the trapezium bone in the distal carpal row. The metacarpal is actually a primordial phalanx. The MCP joint has 6 degrees of freedom producing motion in planes of flexion and extension, abduction and adduction, and pronation and supination. The range of motion of the MCP joint of the thumb may be the most variable in the human body, depending upon individual variation in the radius of curvature of the metacarpal heads. Limited range of motion within this joint is associated with increased incidence of injury. The MP joint has relatively little intrinsic stability. Lateral support arises from the proper and accessory collateral ligaments. The proper collateral ligament arises from the lateral condyles of the metacarpal and travels obliquely to insert on the volar aspect of the proximal phalanx. It is tight in flexion and loose in extension. The accessory collateral ligament arises from the metacarpal neck and inserts into the volar plate and the sesamoids. This structure is more volar in location than the proper collateral ligament and is tight in extension and loose in flexion. The CMC joint consists of an articulation between the trapezium and the metacarpal base composed of two reciprocally interlocking saddles with perpendicular longitudinal axes. Ligamentous stability at the trapeziometacarpal joint is maintained by the anterior (volar) and posterior oblique ligaments, the anterior and posterior intermetacarpal ligaments, and the dorsal radial ligament. The anterior (volar) oblique originates on the trapezium and inserts into the volar beak of the thumb metacarpal. This is the most important ligament in maintaining CMC stability. The dorsal ligament is not as strong as the volar ligament but is reinforced by the APL. No absolute contraindications to the treatment of thumb injuries exist. Virtually all injuries are amenable to immobilization or open reduction with or without fixation. Meals RA, Meuli HC. 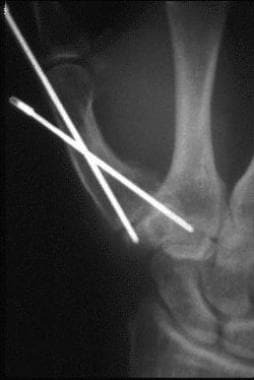 Carpenter's nails, phonograph needles, piano wires, and safety pins: the history of operative fixation of metacarpal and phalangeal fractures. J Hand Surg [Am]. 1985 Jan. 10(1):144-50. [Medline]. Carlsen BT, Moran SL. Thumb trauma: Bennett fractures, Rolando fractures, and ulnar collateral ligament injuries. J Hand Surg Am. 2009 May-Jun. 34(5):945-52. [Medline]. American Medical Association. The Upper Extremities. Concchiarella L, Andersson GBJ. Guides to the Evaluation of Permanent Impairment. 5th ed. AMA Press; 2001. 442/chap 16. Moran SL, Berger RA. Biomechanics and hand trauma: what you need. Hand Clin. 2003 Feb. 19(1):17-31. [Medline]. de Jonge JJ, Kingma J, van der Lei B, et al. Fractures of the metacarpals. A retrospective analysis of incidence and aetiology and a review of the English-language literature. Injury. 1994 Aug. 25(6):365-9. [Medline]. Packer GJ, Shaheen MA. Patterns of hand fractures and dislocations in a district general hospital. J Hand Surg [Br]. 1993 Aug. 18(4):511-4. [Medline]. Stanton JS, Dias JJ, Burke FD. Fractures of the tubular bones of the hand. J Hand Surg Eur Vol. 2007 Dec. 32(6):626-36. [Medline]. Stern PJ. Fractures of the metacarpals and phalanges: Fractures of the thumb. Green D, Hotchkiss R, Pederson WC. Green's Operative Hand Surgery. 5th ed. Churchill Livingstone; 2005. 330-42/chap 8. [Full Text]. Culp R, Ratner J. Acute Thumb injuries. Trumble TE, Budoff JE. Hand Surgery Update IV. Chicago, Ill: American Society for Surgery of the Hand; 2007. 51-61/chap 4. Glickel SZ, Barron OA, Catalano LW. Dislocations and ligament injuries in the digits: The thumb carpometacarpal joint. Green D, Hotchkiss R, Pedersen WC. Green's Operative Hand Surgery. 5th ed. Churchill Livingstone; 2005. 382-88. [Full Text]. Alexander C, Abzug JM, Johnson AJ, Pensy RA, Eglseder WA, Paryavi E. Motorcyclist's thumb: carpometacarpal injuries of the thumb sustained in motorcycle crashes. J Hand Surg Eur Vol. 2016 Sep. 41 (7):707-9. [Medline]. Glickel SZ, Barron OA, Catalano LW. Dislocations and ligament injuries in the digits: The thumb metacarpophalangeal joint. Green D, Hotchkiss R, Pedersen WC. Green's Operative Hand Surgery. 5th ed. Churchill Livingstone; 2005. 366-82/chap 9. [Full Text]. Soyer AD. Fractures of the base of the first metacarpal: current treatment options. J Am Acad Orthop Surg. 1999 Nov-Dec. 7(6):403-12. [Medline]. Sarris I, Goitz RJ, Sotereanos DG. Dynamic traction and minimal internal fixation for thumb and digital pilon fractures. J Hand Surg [Am]. 2004 Jan. 29(1):39-43. [Medline]. Papandrea RF, Fowler T. Injury at the thumb UCL: is there a Stener lesion?. J Hand Surg Am. 2008 Dec. 33(10):1882-4. [Medline]. Thirkannad S, Wolff TW. 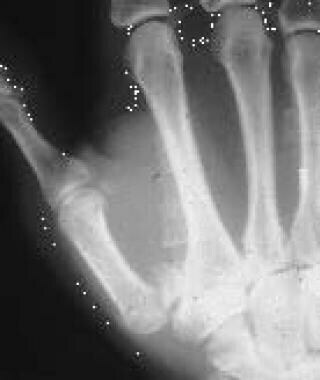 The 'two fleck sign' for an occult Stener lesion. J Hand Surg Eur Vol. 2008 Apr. 33(2):208-11. [Medline]. Edmunds JO. Traumatic dislocations and instability of the trapeziometacarpal joint of the thumb. Hand Clin. 2006 Aug. 22(3):365-92. [Medline]. Connell DA, Pike J, Koulouris G, et al. MR imaging of thumb carpometacarpal joint ligament injuries. J Hand Surg [Br]. 2004 Feb. 29(1):46-54. [Medline]. Abe Y, Rokkaku T, Tokunaga S, Yamada T, Okamoto S. Closed mallet thumb injury: our experience of 10 patients treated with surgery and a systematic review. J Plast Reconstr Aesthet Surg. 2016 Jun. 69 (6):835-42. [Medline]. Khursheed O, Haq A, Rashid S, Manzoor N, Shiekh S, Mushtaq M. Clinical Outcome of Metacarpophalangeal Joint Dislocation of the Thumb in Children: Case Series of 10 Patients. J Hand Microsurg. 2016 Apr. 8 (1):13-6. [Medline]. [Full Text]. Senda H, Okamoto H. Palmar dislocation of the thumb metacarpophalangeal joint: report of four cases and a review of the literature. J Hand Surg Eur Vol. 2013 Aug 1. [Medline]. Abid H, Shimi M, El Ibrahimi A, El Mrini A. Articular fracture of the base of the thumb metacarpal: comparative study between direct open fixation and extrafocal pinning. Chir Main. 2015 Jun. 34 (3):122-5. [Medline]. Berger RA. A technique for arthroscopic evaluation of the first carpometacarpal joint. J Hand Surg [Am]. 1997 Nov. 22(6):1077-80. [Medline]. Zhang X, Shao X, Zhang Z, Wen S, Sun J, Wang B. Treatment of a Bennett Fracture Using Tension Band Wiring. J Hand Surg Am. 2012 Feb 1. [Medline]. Giesen T, Neukom L, Fakin R, Beckamm-Fries V, Calcagni M. Modified Suzuki frame for the treatment of difficult Rolando fractures. Hand Surg Rehabil. 2016 Oct. 35 (5):335-40. [Medline]. Fotiadis E, Svarnas T, Lyrtzis C, Papadopoulos A, Akritopoulos P, Chalidis B. Isolated thumb carpometacarpal joint dislocation: a case report and review of the literature. J Orthop Surg Res. 2010 Mar 10. 5:16. [Medline]. [Full Text]. Weiland AJ, Berner SH, Hotchkiss RN, et al. Repair of acute ulnar collateral ligament injuries of the thumb metacarpophalangeal joint with an intraosseous suture anchor. J Hand Surg [Am]. 1997 Jul. 22(4):585-91. [Medline]. Tsujii M, Iida R, Satonaka H, Sudo A. Usefulness and complications associated with thenar and standard portals during arthroscopic surgery of thumb carpometacarpal joint. Orthop Traumatol Surg Res. 2015 Oct. 101 (6):741-4. [Medline].